A tornado caused panic and an estimated £10 million of damage today as it ripped through several streets in northwest London. The 100mph twister lasted about 10 seconds but damaged more than 100 houses and left hundreds of people homeless in NW10. One house looked as if its roof had been "taken off by a tin opener" and others had walls torn away leaving rooms exposed and smashing the contents inside. Residents cowered under beds and tables or fled into the streets screaming when the foundations of their homes shook. One man thought his house was going to be "wrenched from the ground". A bus was rocked from side to side as passengers held on to the seats in terror. All the trees in one street were torn up and parked cars were flung around. Roof tiles, bricks and other debris filled the air. Chimney pots came crashing down. At least one man was taken to hospital with head injuries and five others were treated at the scene for cuts, bruises and shock. An area of Kensal Rise was suddenly plunged into darkness just after 11am as the twisting cloud descended. The scene was made even more dramatic by lightning flashes and a hailstone storm. Chamberlayne Road, Whitmore Gardens and Leigh Gardens in NW10 bore the brunt. Colin Brewer, who lives in nearby Trevelyan Gardens, saw "a swirl starting to form and then clumps of all sorts of things flying into the air". 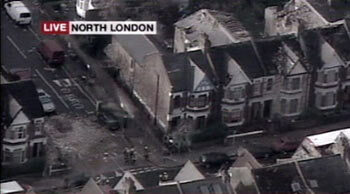 Maya Sendall, an actress, was in her living room in Chamberlayne Road when the tornado struck. She said: "I heard this incredible noise like a train rushing past. It was like a cartoon drawing. Everything just went horizontal." Her neighbour Maureen Haouet, 59, whose two bedroom top-floor flat was badly damaged, was escorted down the road by fire officers to rescue her terrier Sensi. Mrs Haouet said: "I found her in my bedroom. She was trembling, whimpering. All the windows are blown in. There is rubble everywhere. Part of the roof is missing and everything is broken inside." Mrs Haouet was reunited with her daughters Sonia, 18, and Roxanne, 23, in the street. All three embraced and wept. Roxanne said: "What are we going to do? Where are we going to stay?" Piyel Haldar, 40, a law lecturer at Birkbeck university, who lives on Dundonald Road, said: "Rows upon rows of cylindrical waves of water were being sucked sideways from the gutters. "There was a complete haze of darkness through which I could see tiles being ripped off the top of houses and trees being pulled from their roots and sucked into oblivion. I was frozen to my feet. I was shocked by what was happening and too frightened to move." Miko Adam, 33, a travel agent, was helped from his house in Whitmore Gardens. He said: "There was some lightning strikes and then suddenly, out of nowhere, this cyclone whipped up. "It was terrifying. I was in my attic and had to crawl under the bed because I thought the roof was going to come down. I could feel the foundations of the house move and it felt like we were being wrenched from the ground. "My neighbour had the entire side of her house ripped off. She ran out into the road after it happened and was screaming. "Practically every tree on my street has been ripped out at the root and cars which were parked have been flung about. As soon as the cyclone passed the sun came out and there was not a cloud in the sky but it has left behind total devastation. It looks like a war zone. "Some of the houses are not safe because of the extent of the damage. So far I have not seen anyone with any major injuries - just cuts and grazes. I am surprised nobody is dead." Kate Rew, 37, from Kensal Rise, was on a bus in Chamberlayne Road when the tornado struck. She said: "The bus was rocking from side to side and I thought that it could fall over any moment. We were all holding on to our seats and we didn't know what was happening. It blew out a window of a house and the side of a bus shelter where little old ladies were sitting. This almighty wind struck up. And then it all just stopped." Tim Klotz, 34, who had recently moved to the street, said it happened right in front of his house. "I was in an attic room working at my desk on the computer and there was heavy rain and sleet and then the wind just really changed," he said. "I looked up through a skylight and debris was falling through the air. I heard what seemed like dominoes falling, which I think were roof tiles." He said it then went "a bit dark" so he went downstairs and heard a smash at the front of his house. "I was very lucky because there was only a broken window and some damaged roof tiles but another house had its roof peeled off and fences had come down along the street." Jenny Dyson, who lives in the area, said: "I was walking past and had to shelter in a doorway. One house was destroyed. It looked like someone had taken off the roof with a tin opener." Caroline Winterburn said: "Tiles and flowerpots and bricks and things were flying through the air and hitting the kitchen window. All the fences down the road were going down like a pack of cards. A friend in Whitmore Gardens has lost half her roof and panes of glass in the windows, and the car's a write-off as well. "There's a house in Leigh Gardens where scaffolding has come completely away from the house and fallen down across the front garden and the pavement. 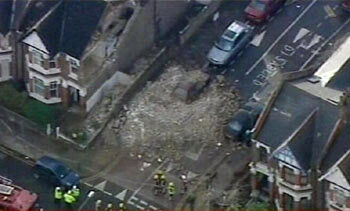 "A house on the corner of Chamberlayne Road and Whitmore Gardens has lost its side. All of the brickwork has just gone so you can see into the house down the side into the living room and a bedroom." The Met office said the tornado was caused by a squall line - a line of thunderstorms that have a "common lifting mechanism" - passing overhead. Emergency services rushed to the area, closing off roads and evacuating families from the wreckage. A London Ambulance Service spokesman said: "We have sent four ambulances, two fast response cars and two officers to the scene. We have also activated the helicopter emergency medical service." Initial estimates suggested that insurers could be facing claims for between £5 million to £10 million to cover the damage. A number of houses will need complete rebuilding and scores more will require major repair work. A spokesman for the Association of British Insurers said damage caused to homes and businesses would be covered by buildings insurance. Most household policies would also cover the cost of alternative accommodation, up to the policy's limit, if residents needed to move out while repairs were carried out. Damage to vehicles would be covered under comprehensive motor insurance, the ABI said. The spokesman said people should arrange for temporary repairs to stop damage worsening if necessary, and to keep all receipts as they would form part of any insurance claim. A Brent council spokesman said the authority was assessing the damage and had sent officers, including tree and building experts and contractors, to help with removing fallen trees and damaged properties. He added: "The council has set up a respite centre at the Church of the Transfiguration in Chamberlayne Road. Any residents who are homeless should report there." 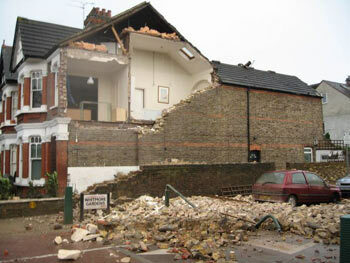 Trail of dustruction: A tornado tore through north London ripping the side from this house in Kensal Rise. An aerial view of the street shows the extent of the damage. A car parked outside was destroyed after debris was thrown hundreds of feet into the air. High winds smashed windows, sending glass flying, and tiles were blown off roofs. 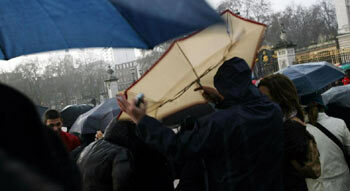 Hold on to your hats: Meanwhile elsewhere in London, visitors outside Buckingham Palace were disappointed as the Changing of the Guard had to be cancelled due to the stormy weather. Last edited by Blackleaf; Dec 7th, 2006 at 01:31 PM..
Today's tornado in North West London was a medium-sized twister by British standards. Initial reports of the level of damage to trees, roofs and cars indicate wind speeds of around 100mph (160kph in funny measures), a T3-T4 strength tornado, on a scale ranging from T0 to T10 developed by the Tornado and Storm Research Organisation (Torro). In fact, Torro had issued a forecast alert of thunder, hail, lightning and tornado as conditions in the southern half of Britain turned convective. This meant that air was rising through the atmosphere - a surge of warm, moist tropical air rose up and hit colder drier air higher up, exploding into thunderclouds. This produced a squall line, a violent band of thunderclouds, which tore across Southern England during the morning. Crucial for the development of a tornado, the winds in the atmosphere were coming in different directions and set the air spinning inside a cumulo-nimbus cloud, rather like whirling a child’s spinning top. As a vortex created within, the cloud grew increasingly narrow and spun faster – rather like an iceskater spinning faster as they flatten their arms against their body - until eventually a funnel-shaped cloud grew from the bottom of the thundercloud and touched the ground with violently rotating winds: a tornado. Such incidents in this country are often incorrectly dubbed "mini-tornados" in the media. In fact, tornados in Britain can be as powerful and destructive as the infamous twisters of Tornado Alley in the American Midwest. In July 2005, Birmingham was struck by one of the most brutal tornados recorded in this country, with wind speeds estimated to have reached over 140mph (225kph), which blasted out shop fronts, ripped off roofs, brought down buildings and felled more than 1,000 trees. Nineteen people were injured and damage was estimated at £39 million. Coincidentally, tomorrow marks the anniversary 52 years ago of another violent tornado in West and North West London. A huge thunderstorm drove in from the South Coast, the sky turned ink-black and a tornado touched down at Bushey Park, near Hampton Court, smashing down trees. At around 5pm, the storm reached Chiswick, West London, with a huge conical cloud hanging down from the sky, green lightning flashing from its sides and a deafening roar like an express train. The tornado blew Gunnersbury station apart before demolishing two nearby factories and driving on through Acton, not far from BBC Television Centre, and on to Willesden, close to Kensal Rise. 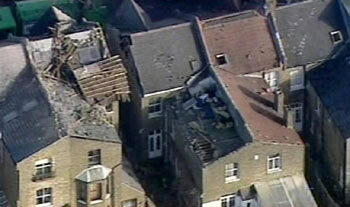 Roofs on houses were ripped off, chimneys crashed down and walls collapsed. A car was reported hurled through the air whilst terrified people outside ran for cover as a barrage of bricks, glass and wood shot through the air like missiles. Newsreels of the day showed a scene of devastation described as looking like something from the Blitz. The vortex cut a swathe of devastation for several miles, finally petering out around Golders Green and Southgate in North London. Amongst all this mayhem, it is incredible that there were very few casualties, with only minor injuries. Not a good thing to have happened. But not much the average person can do to prevent them. Not sure about England have the most tornados per sq km. Parts of the US can certainly claim a lot of Tornados every year. But it isn't a title any region or country would want.